Elkin: This is one talky book. Joshua Dysart is all about conversation in Harbinger #22. Everybody is yak-yak-yakking so much that by the end of it, I have this mental image of letterer Dave Sharpe putting his lettering hand in a bucket of ice water and there's that comical hiss as steam rises forth. But that's okay, because Dysart is using all these words (well... most of them anyway) in order to push narrative, unfold character, and invest his audience in where he's taking them. Oh yea. It's the start of a three part arc in which A HERO MUST DIE! Valiant seems to be playing the “tried and true” comic book publisher game of event books and hero deaths. And hey, that's fine – so far Valiant has shown that they value story over event, character over trope, and creators over sales (for the most part). In Dysart's hands, this whole “death of a hero” gig may actually have a fresh face. There's two more issues left in the story – and even though I've already got my bets down as to “WHO DIES” – I'm trusting the creators to keep me invested. I'm also taking bets as to whether or not in the Valiant Universe, dead means dead. What do you think the over/under is on this, Wunderlich? Wunderlich: I skipped the solicitations and jumped right into this one, which is all for the better I must say. Reading this from cover to back, not knowing Valiant was about to pull a “one must die”, I found this issue extremely enjoyable. 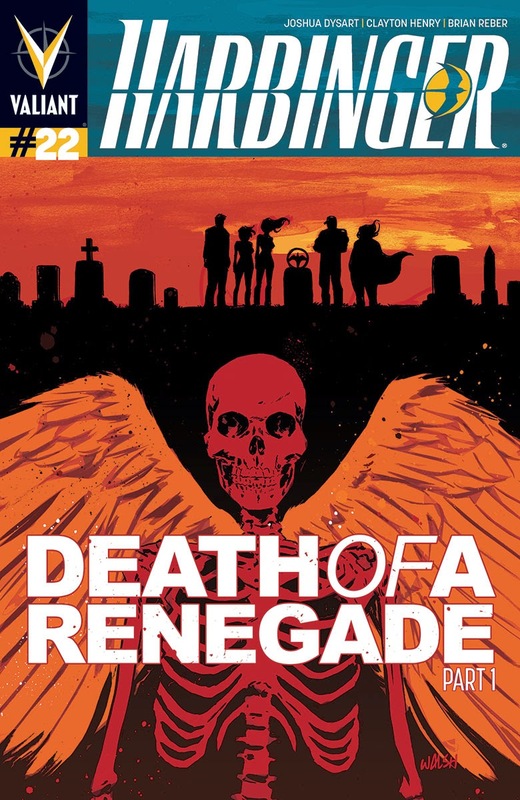 I wasn’t thinking about the traditionally tacky, hype machine that is character death, I was thinking about how awesomeHarbinger is. And that’s just it. Ignore the hype and what we have here is an awesome book. Where you found Dysart talky, I found the word-to-picture ratio perfect. Things actually happen in this book! There’s plenty of character development and plot advancement. This is an unfortunately rare thing these days. Clayton Henry’s art must be mentioned as well. This guy…man. He draws the hell out of this book and makes it seem easy. There aren’t too many flashy, splashy panels, but each and every moment is rendered the way it should be. It seems so seamless as well, like Henry is playing the role of film-editor more than cinematographer. The choice angles, the great expressions, the perfect character moments and the intense action—it’s all in the right spots. He isn’t concerned with giving us breathtaking vistas and hyper-detailed realism; he’s putting the perfect pictures in the perfect spots. So yes, I thoroughly enjoyed Dysart and Henry’s expertly paced, gorgeously drawn high-stakes adventure. By the end of the book I was so invested in the story I actually cared that a character will die. I don’t care if dead is dead here Elkin, if Valiant keeps cranking out books of this caliber I’m on board.